This math station activity is intended to help students understand how to fluently divide multi-digit numbers, and to fluently add, subtract, multiply, and divide multi-digit decimals using the standard algorithm for each operation. 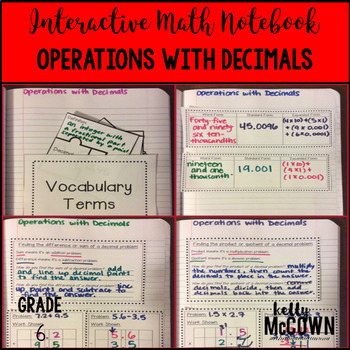 These interactive notebook activities are intended to help students understand how to fluently divide multi-digit numbers, and to fluently add, subtract, multiply, and divide multi-digit decimals using the standard algorithm for each operation. 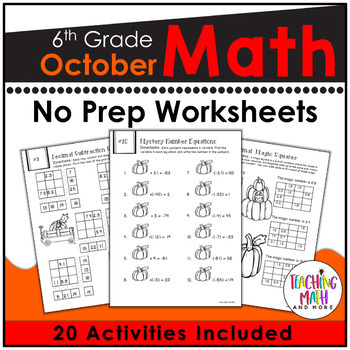 -Activities include: Vocabulary, Practice of writing Decimals, Adding & Subtracting Decimals, and Multiplying & Dividing Decimals. 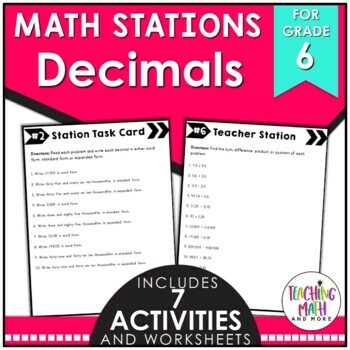 Teaching decimals can be fun and engaging for students to learn, refresh, or review. Using manipulatives, activities, games, or worksheets can be helpful. Keep them actively engaged in the process and their learning gains will increase.